Don’t believe the voices clamoring about our 21st-century society being exceptionally rude and willing to belittle others more virulently than ever. “Distory” proves that people — especially some in high office — have been saying ugly things about the rest of God’s children for a good long time. The whole book is like that, a series of quotations by individuals who have taken the kidgloves off and vented about another. 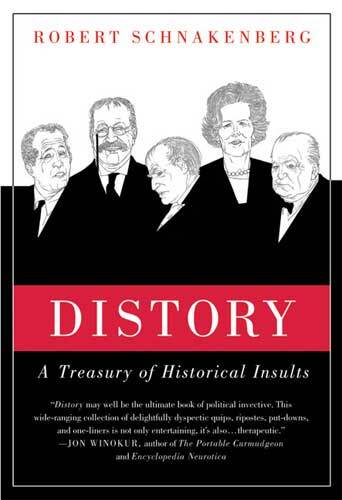 Because the quotes are organized into chapters of insults by and about a) Americans, b) Brits, c) military figures, d) other nations and e) miscellaneous, and because they are listed chronologically, “Distory” can claim to teach us a bit of history as well. “Treasury” might not be the choice of nouns that polite folks would have used. In fact, some of the remarks are clever and witty. Others plain mean and graceless. But I found it valuable to read the American chapter from beginning to end. It was a refresher course in history — and a mostly witty one at that. I learned, too, what some of the great names in history felt about others of their time, perspectives that weren’t in my elementary or high school history books. Guess about whom pamphleteer Tom Paine — the lauded author of “Common Sense” — called “treacherous in private friendship . . . and a hypocrite in public life”? Would you believe George Washington? My favorite quotations, however, are this clever bit of repartee between playwright George Bernard Shaw and Prime Minister Winston Churchill.